Day 1 : Arrive Bagdogra airport and transfer to Gangtok 124 kms., 6 hours drive. Lunch en route. On arrival at Gangtok check into hotel. Folowed by briefing. Eening visit to see the breath taking sunset of Mt. Kanchandzonga and Mt. Sinolchu, from Tashi view point. Return to hotel. Day 2 : Visit to Rumtek Monastery, Jawaharlal Nehru botanical garden, the epica garden, followed by lunch at the hotel. Afternoon visit to enchey monastery, cottage industry, institute of tibetology and do-drul chorten. O/n at hotel. Day 3 : Morning excursion to tsangu lake 34 kms. From Gangtok, close to the Indo-Tibet-Border, it offers different colours and beauty in four seasons. It is peaceful, serene and tranquil. Return to Gangtok. Spead evening at leisure to see gangtok market. O/n at hotel. Day 4 : After breakfast drive from gangtok to pemayangtse check into hotel mt. Pandim/Tourist lodge. Pemayangtse the perfect sublime lotus. 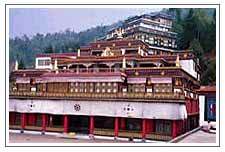 The pemayangtse monastery, which is the 2nd oldes monastery in sikkim belonging to the tantric nyingma-pa sect. Inside the monastery is the fabulous 'Santhokpalri' said to have been revealed in a dream and carved single handedly out of wood. A short walk brings you to the sangna cholling monastery in the midst of a forest secluded and serene. After lunch a leisurely stroll down to the palace ruins of rabdentse which was the first government of sikkim, constructed after the consecration of the first king phuntshog namgyal in 1642 R.D. O/N at hotel. Day 5 : After breakfast drive down the valley to rimbik and 20 odd kms away is the serene and sacred lake of khechopalri. This is the largest low altitude lake in this region of the himalayas. A pilgrime centre, this lake is associated with many legences- the most popular being that thelake is kept clean by the birds of the surrounding forests. Lunch by the lake. Afternoon visit the dubdi monastery which is the oldest existing monastery of sikkim; built during 1700. Return to pemayangtse. O/N hotel. Day 6 : Drive back from pemayangtse to gangtok- through tea plantations at temi. Picnic lunch will be served en route. Arrive gangtok late in the afternoon. Check into hotel. O/N at hotel. Day 7 : Departure gangtok for bagdogra to catch your onward flight.